Philip Paar has been recognized as a geo design, Grassroots GIS, and landscape visualization enthusiast. In 2010, he started an ongoing affair with the digital content creation industry. Autodesk 3ds Max® users of this Blog are invited to check out the Laubwerk Plants Kits Freebie for free trial at laubwerk.com. Now, that took me by surprise: On April 26th, Google announced that it will sell Sketchup to Trimble. In a statement on the Google SketchUp blog, SketchUp Product Manager John Bacus promises that they will further provide a free version of Sketchup and that it will appeal to various target groups while focusing on architecture, engineering and construction industries. However, an immediate implication is the transfer of licenses and personal data to Trimble including non-geolocated (!) 3D models in the Google Warehouse (geo-located models submitted before the closing date belong with Google but Trimble gets a license to use them in the future). I am not a lawyer but it shows how quickly data could change owners these times… Today, the 3D warehouse models we constructed were owned by Google, tomorrow they will be owned by Trimble (who develops, unlike Google, military systems as well). Other than that, I tend to be slightly optimistic that Sketchup will keep being one of my favorite tools as Trimble has a good reputation in GPS and surveying. I still remember my undergraduate studies where we already used Trimble equipment… Lately, Trimble seems to diversify and has shown an enormous appetite for buying various companies specialized in aerial data collection, CAD and GIS software, mobile systems, laser scanning, photogrammetry, and even UAV and RFID technology. Well, I hope that Trimble will further professionalize SketchUp without loosing its amazing intuition that revolutionized 3D modeling. Presenting my own poster “Model-based Visualization of Future Forest Landscapes” on the use of Biosphere3D in the Kimberley project at CALP, I got in touch with other researchers in the field. LIAMA, the Sino-French Lab of Computer Science, Automation and Applied Mathematics in Bejing, presented a poster on GreenLab. GreenLab is a program for the stochastic, functional and interactive modeling of plant growth that also considers different growth conditions. According to Prof. Kang, the development of GreenLab goes back to AMAP and Philippe de Reffye, one of the AMAP developers, who is also guest researcher at LIAMA and contributed to the development of GreenLab. The libraries of GreenLab will also contain more Asian species which are still rare in 3D. With its potential for functional modeling, Greenlab may become another promising plant modeler. Later in the day, I visited the Speedtree booth. 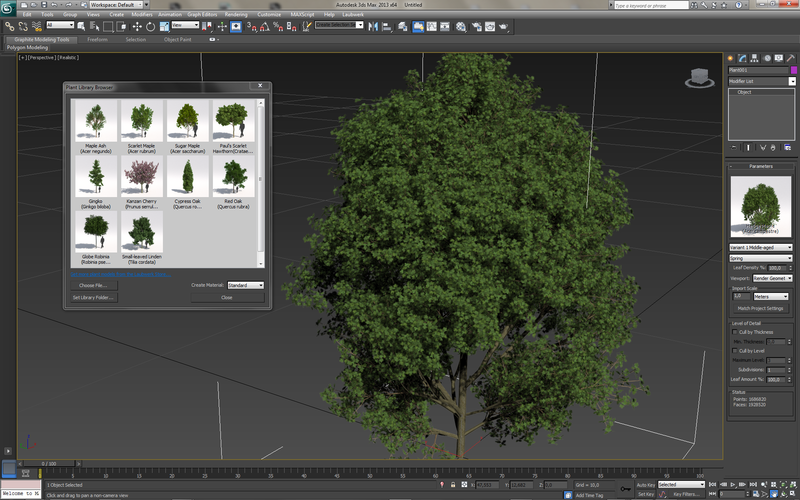 Speedtree clearly aims at Game Developers and Movie Makers; therefore it does not need to integrate botanical rules but it has to provide artistic control and “directability”. Furthermore, performance and different LODs are important for game developers and in gaming, SpeeTree is the current state-of-the-art. For landscape architects, it may be over the top with the basic version of SpeedTree Studio selling for $850 while the professional version, including a world construction set, can cost more than $12k. Texture-Lobes for Tree Modelling from Soeren Pirk on Vimeo. The afternoon was dedicated to urban modeling, starting with a review of the latest literature by Peter Wonka (Arizona State University) and Daniel Aliaga (Purdue University). During the second part of the session, Pascal Mueller from Procedural/ESRI (CityEngine) presented issues encountered in practice and their new Urban Vision project together with the urban planning department of San Francisco and Urban Sim (Paul Waddell). The session closed with a visually very engaging case study by Michael Frederickson from Pixar, using CityEngine for virtual London in Cars 2.
Who should attend? : This workshop is intended for Canadian nonprofit technology specialists. On July 11, 2011, Esri has announced the acquisition of Procedural Inc, Zurich. Years after the nifty but discontinued attempts of the SketchUp 6 / ArcGIS 9.2 Plug-in, ESRI takes the gloves off and finally makes a true jump into 3D cities modeling, planning and design. And finally GIS meets Games Design and vice versa. The rule-based approach of CityEngine apparently tasted right to Esri. Here are FAQs for CityEngine customers. Personally, I like the Question “Who is Esri and Jack Dangermond” the most. FYI, Procedural customers: Jack is one of the most interesting personalities I have met and he has a memory for faces and names of several petabytes. I find it very interesting how Esri’s GeoDesign strategy and the CityEngine technology will merge. Digital Urban highlights a Microsoft SIGGRAPH paper and patent that present an advanced Street View like technology, which combines the immersive nature of 360° Panoramas with the overview provided by multiperspective strip panoramas. The video also demonstrates the almost seamless transition between the panoramas. This blog has already reported about the landscape renderer Vue and about CityEngine, a tool by Swiss company Procedural Inc. that allows creating 3d city models from scratch. Now, there is a new product marrying both, CityEngine Vue.